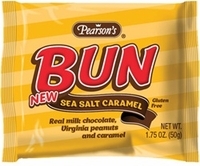 Caramel bun bar by Pearson's. A creamy caramel center which is then covered with real milk chocolate mixed with unsalted peanuts now made with sea salt. These are truly an old time candy bar. I am sure you remember eating these bun bars when you were a kid. They are just as good today as there were 100 years ago. Although the bun bars may be hard to find locally you can buy bun bars at our online candy store. �	Made in the U.S. A. Each box has 24 bun bars.